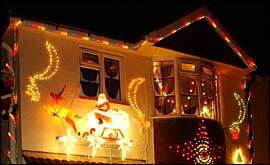 Christmas lights are put up in homes all over the country during the festive season - but some families go one step further than just decorating the Christmas tree. 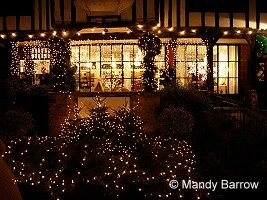 Ten years ago it was arare sight to spot a brightly-coloured magical front garden filled with festive decorations. 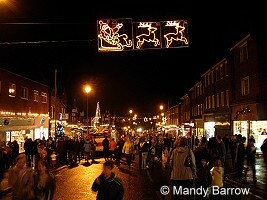 But now-a-days more and more people are adding dancing santas, flashing stars and giant sledges to the front of their houses during the festive season. 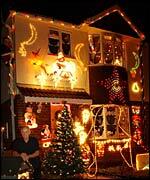 Many of these highly decorated houses attract big crowds of passers-by and are using the opportunity to collect money for local charities. 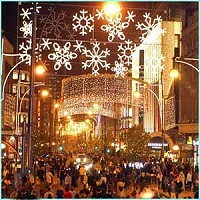 Towns and cities put up colourful lights across the streets and shops are decorated too. Even Buckingham Palace entered into the Christmas spirit by being lit up during Christmas 2003. 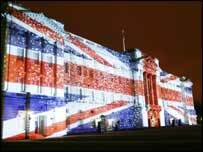 From Christmas Eve, projectors "wrapped" the Palace in a giant Union Jack and wrapping paper. The effect was part of the Brightening Up London project which also illuminated nine other famous buildings in the city with seasonal images.